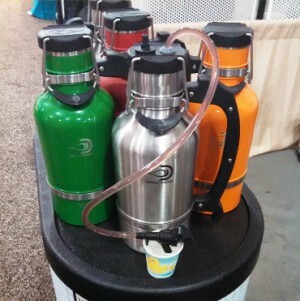 I first wrote about the stunningly good thermal steel growlers from Drinktanks, the Bend, Oregon company which finally gave me a thermal growler I could write about and recommend, back in April of this year. After receiving five different steel growlers over the past three years and after well over 400 (at current count) reader requests for help with the seemingly-simple problem of putting cold, effervescent beer into a container and then keeping it both cold and bubbly for longer than a day, I tested the 64 oz. Drinktanks and it not only performed as advertised but exceeded even the company’s own claims. 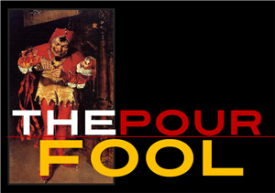 I was floored by how rock-solid and easy to use it was and said so, in this post. But having a growler, thermos, or cooler work at first is only half the battle. The true test comes in repeated usage, the long haul: is this thing going to keep working or is it suddenly start developing more bugs than a peeled banana left overnight on your patio? The Drinktanks growler is the beer containment equivalent of Marshawn Lynch, a thing which over-performs and makes it look easy. After almost nine months of being tossed casually into my car trunk, shoved under my front seat, falling out of a rental truck while I was moving us to Tacoma, and being used, on one irrational occasion, as the closest thing at hand to hold up a broken window frame, it now has one tiny ding on the shoulder and that is IT. The wire and bale closure is by miles the easiest opening/sealing design of any growler I’ve tested, and it has, five times now, held beer to within five degrees of what it was just upon filling, after sitting out, unrefrigerated, all night. Maybe even better than the chill retention is the fact that it keeps carbonation viable FAR longer than any other growler I tested. I’ve gotten FOUR DAYS (while we were moving and spent three nights in hotels, a thing I plan never to repeat) and still had enough fizz left to form a head on our Geaux Brewing “Camellia”. I don’t want to belabor the point, here: Drinktanks is the Rolls Royce of American thermal growlers. In my somewhat extensive experience of the genre, nothing else really even comes close. I cannot recommend this too highly. 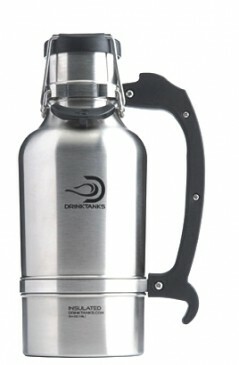 If you love beer and believe in holding it, transporting it, and serving it to its best advantage, you will at least check out Drinktanks and see for yourself what a well-built, beautifully-designed thermal growler that’s built for the long run can do. If it costs a bit more than other growlers, rest assured that it will not cost twice what those do, and that’s the legit comparison: you can buy one Drinktanks and keep it for what I’m betting will be at least eight to ten years, OR you can buy another one, break it, and buy a second – or more! – during that same time. The choice is yours. I choose Drinktanks.